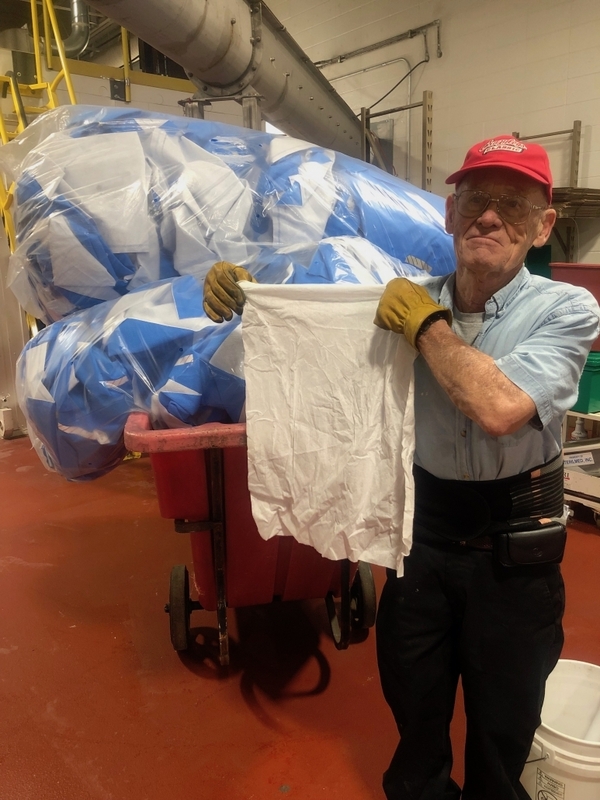 If you want to fly a sustainability flag at your hospital or clinic surgical center, one of the easiest ways is to do it is blue wrap recycling. But if you want this to happen, you need to follow a couple simple rules when recycling your surgical blue wrap. Rules you say? It’s worth it. Diverting waste from the landfill translates to a better sustainability record and a cleaner world. We even have this free poster for you to follow to make sure you properly recycle your blue wrap. What is Blue Wrap and How Can it Be Reused? Blue wrap binds sterilized surgical tools to prevent contamination. Once it’s removed, don’t trash it! This heavy-duty polypropylene #5 is collected by certain waste disposal companies, like MERI to be recycled into other products, including the fiberglass that’s installed behind the bumpers of cars. 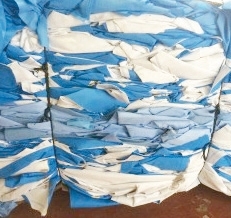 One of our customers recycled almost 19,000 pounds of blue wrap – about 10 percent of its total biohazard waste. In order for the blue wrap recycling process to work, it’s important to follow this simple rule. Blue wrap must be separated out from the rest of your medical waste. Our customers put their blue wrap into a clear plastic bag for us to collect. We do this at the same time we pick up their medical waste. Again, it bears repeating: Separate your blue wrap from the rest of your medical waste if you’d like it to be properly recycled. We’ve seen everything from paper towels to medical instruments and devices to knee joints. Yes, you read that correctly. They were in with the blue wrap recycling bag. If anything is in the bag that shouldn’t be, it contaminates the entire bag, and the whole bag thrown out instead of baled. Oh, and if you’re still stuck on the knee joint and don’t believe us, well, we’re going to spare you a picture of that. Here’s a picture of something we commonly see that just won’t fly. A simple paper towel jumbled in with the blue wrap bag. The recycling center would reject the entire load if not for our MERI man Bob spotting it ahead of time and taking it out of the pile before baling. The ONLY thing that should be in your clear blue-wrap bag is blue wrap or associated tape used around the blue wrap that holds the medical instruments. To educate everyone on proper blue wrap disposal, hang this poster to make it abundantly clear above your blue wrap container. Most importantly, hang it near where your blue wrap recycling bin is located. 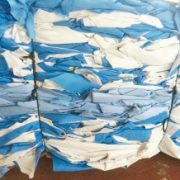 If you’re a medical clinic or surgical center looking to improve your sustainability record, recycling blue wrap could be your answer. But remember, your efforts are only as good as making good on proper blue wrap recycling. That way, your blue wrap will get new life rather than end up in the landfill.